ssess a maximum impact training tool for the worlds most effective abs, no question, eludes detailed follow-along instructions on how to perform most of the exercises scribed in the companion book, Bullet-Proof Abs Demonstrates advanced techniques for ptimizing results with the Ab Pavelizer. s a former Soviet Union Special Forces conditioning coach, Pavel Tsatsouline already .new a thing or two about how to create bullet-stopping abs. Since then, he has combed the world to pry out this select group of primevally powerful ab exercises—guaranteed to yield the fastest, most effective results known to man. • Fry your abs without the spine-wrecking, neck-jerking stress of traditional crunches. • No one—but no one—has ever matched Bruce Lee's ripped-beyond-belief abs. What was his favorite exercise? Here it is. Now you can rip your own abs to eye-popping shreds and reclassify yourself as superhuman. • Russian fighters used this drill, The Full-Contact Twist, to increase their striking power and toughen their midsections against blows. An awesome exercise for iron-clad obliques. • Rapidly download extreme intensity into your situps—with explosive breathing secrets from Asian martial arts. • Employ a little-known secret from East German research to radically strengthen your situp. • Do the right thing with "the evil wheel", hit the afterburners and rocket from half-baked to fully-fried abs. • "Mercy Me!" your obliques will scream when you torture them with the Saxon Side Bend. 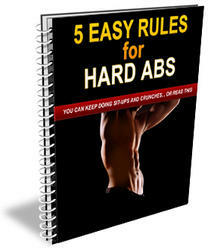 • How and why to never, never be nice to your abs—and why they'll love you for it. • A complete workout plan for optimizing your results from the Janda situp and other techniques. "Power to the People! is absolute dynamite. If there was only one book I could recommend to help you reach your ultimate physical potential, this would be it."